OMG Posters! » Archive Klutch Benefit Art Print by Horkey, Bratrud, Aye Jay - OMG Posters! Diesel Fuel Prints is set to release this benefit art print by Aaron Horkey, Todd Bratrud, and Aye Jay later this morning. The three artist collaborated in order to raise funds for artist Klutch, who recently came into a ton of medical expenses. An exact time isn’t known, but keep an eye on DieselFuelPrints.com starting around 10am PST. All of that coming out of the window of a little car? Iraqi children killed by American and British soldiers in search for cheap gas for Mr Jones SUV in Florida. Maybe its a evil Ram that collects skulls but likes to drive hot wheels. Maybe I am reading to much into this. Yeah I don’t get this. 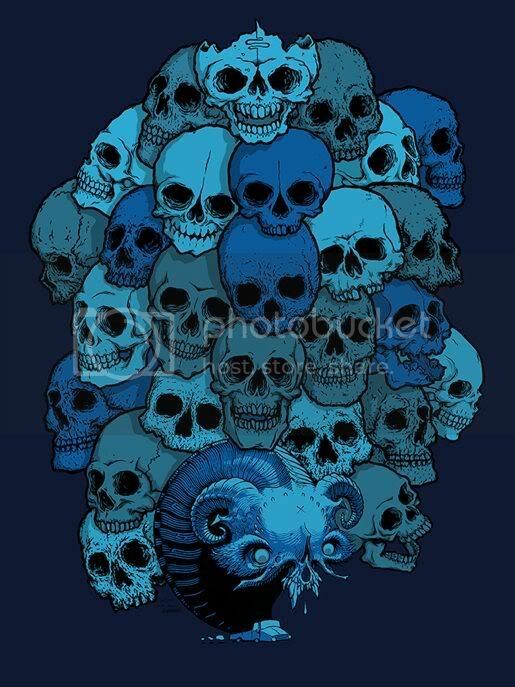 Whats those chambers that are underground in that famous city with all the stacked skulls? Kinda reminds me of that.